It’s Woodhaven Park Association Picnic/Meeting time again and the Floberg’s are hosting the annual event at their home (7467 Woodhaven Drive). We invite you to join us on Sunday, September 10th. We’ll begin with the pot-luck picnic at 4 p.m. followed by the business meeting with the election of officers around 5:00. If your schedule does not permit you to attend the meeting please complete the attached proxy form and deliver it to me or another association officer at your earliest convenience, or ask a neighbor to deliver it on your behalf to the meeting. It is important that you participate, either in person or by proxy, to ensure that the association may conduct business on behalf of our community. And, on a final note, our treasurer, Chic Smith, will be collecting annual dues at the meeting. Your $15 annual dues pays for street lights along Woodhaven Drive and other expenses. If you’re unsure whether or not you’re in good standing, please call Chic Smith (301-934-1381). Thank you for allowing me to serve you the past two years and I’m looking forward to seeing you soon! Our neighbors, the Clements’, are planning to have a yard sale on Saturday, June 24th in the morning. A number of people have been asking about dates for a community yard sale; therefore, this is a great opportunity to piggyback off their date and drive more traffic and potential buyers into our neighborhood As you know, yard sales are a good way to get rid of items you no longer want or need and make a few dollars, too. A community yard sale -- with more promotional efforts – is an excellent idea to generate more interest and more business. Therefore, Charlotte Clements has volunteered to place notices on-line and in print, and Carroll will place signage at the entrance of Woodhaven Park. I thank the Clements’ for taking this initiative and encourage as many homeowners to participate, as you see fit. In addition, any efforts you may be able to contribute to let your neighbors and friends know about this event are most appreciated. Yes, it’s that time again and the Floberg’s are hosting the annual event at their home (7467 Woodhaven Drive). We look forward to seeing and visiting our neighbors on Sunday, September 13th. We’ll begin with the pot-luck picnic at 4 p.m. with the business meeting and election of officers around 5:00. If your schedule does not permit you to attend the meeting I ask that you complete the attached proxy form and deliver it to me, or our secretary, Joy Chapman, or another officer at your earliest convenience. It is important that you participate, either in person or by proxy, to ensure that the association may conduct business on behalf of our community. And, on a final note, the new treasurer will be collecting annual dues at the meeting – and if you haven’t paid your dues for 2015 there is still time. Dues – which pays for street lights in the park and other expenses – are only $15 per household per year. If you’re unsure whether or not you’re in good standing, please call Charlotte Clements (301-934-9444). 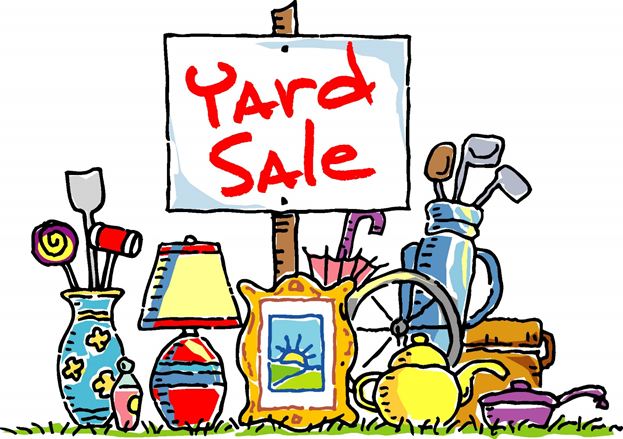 Just a reminder that one family in our neighborhood is planning a yard sale beginning at 8 a.m. this coming Saturday, April 25th. If you are interested in being a part and benefiting from the increased traffic and prospective customers, be sure to put your usable items out and take advantage of the opportunity. Another Woodhaven family has planned a yard sale for the next Saturday as well, so please keep that in mind as well. v Bring your rakes, shovels, blowers (esp. hand-held) spades, hoes, plants, mulch, gloves, etc. v Remember your trash bags for your walk through the Park!! v Meet at the entrance at 8:30 am on Saturday, April 18th. Come join in the fun: hot drinks, water, juices, and pastries will be provided!! Charlotte Clements is still accepting dues for 2015. You can drop/mail your $15 check by the Clements' at 7473 Woodhaven Dr., payable to Woodhaven Park Association. Association President Greg Floberg at 301-934-3086 if you're interested. It is with great sadness that I share the news of Carol Pappaianni’s passing with you. She was a good neighbor and friend. Please keep her husband, Jeff, and her family in your prayers. Carol died on March 4, 1015, following complications from surgery and her ongoing medical conditions. I have been informed that viewing will be at the Arehart-Echols Funeral Home in La Plata on Wednesday, 3/11/15, from 2 p.m. to 4 p.m. and 6 p.m. to 8 p.m. with prayers at 7 p.m. The funeral will be at 11 a.m. on Thursday, 3/12/15, at Saint Ignatius Loyola Church, Hill Top in Welcome (approximately 10 miles West of Highway 301 in La Plata on Route 6 just after the Durham Church Road). Carol and Jeff moved into our neighborhood about five years ago (first house on the right on Woodhaven Drive). The Woodhaven Association will be making a $50 donation to the family’s charity of choice in Carol’s name, and information is available on Arehart-Echols website, http://www.arehartechols.com/obits/obituary.php?id=536165 . Last night, 1/31/15, a number of children were playing in our yard when two dogs, a German Sheppard and a white Lab, ran across the street and chased these kids. All the kids were running scared away from the dogs and one child was hurt when he ran into an obstacle and got a bloody nose along with a minor cut. He was terrified, as was his mother, but luckily, he was not seriously injured. The adults who heard the screaming and shouting from inside the house and ran outside to see what was going on when, they too, were confronted and threatened by these growling and agressive dogs. 911 was called and the Charles County Sherriff’s Department arrived to investigate. Even though the children were scared to death, no charges were filed because “no human was bitten.” The owner of the animals informed Deputy Rash that “their dogs had not been out of the house” and suggested that the dogs in question belonged to another family. The Deputy checked that out as well and shared his findings with us. He further stated that animals are not allowed to roam free and must stay in their own yard unless they are leashed. For the safety of everyone in the neighborhood, Deputy Rash suggested that if anyone sees a dog running loose they should call Animal Control immediately at 301-609-3425 to get the animals picked up. Please help us keep our neighborhood safe for the individuals who walk and the children who play. Thank you for your attention to this message and please pass it along as you see fit. It's time for Woodhaven Park's 2014 Business Meeting and Picnic. If you know of anyone you feel should be recognized for their service in our community, please contact Joy Chapman, Woodhaven Parks Homeowners Association. Attached are the minutes from the special meeting along with the updated bylaws for your information and files. Our secretary had other commitments and was unable to attend the meeting, and because I was so involved in the updates I am distributing the document along with the minutes that Millie Havrilla volunteered to take. Thanks, Millie, for your help. Future notices will be sent out by Joy Chapman, who was re-elected at this past meeting, but because time is of the essence, I wanted to alert everyone of the upcoming activity that is scheduled for December 7th. If you are available to help out, please come help rake leaves and clean up the Park entrance. Tom Cox has volunteered to host the clean up, so bring your rakes, blowers, work gloves and enthusiasm to his driveway entrance to join your neighbors in this activity. We’ll look forward to seeing you there at 9 a.m. If you have any questions or concerns, please do not hesitate to give me a call. As many of you are aware, there is a need to conduct a second business meeting during which we will conduct an election of the Park's officers and address other items requiring approval, including changes to the Woodhaven Park Association bylaws. We failed to perform these very essential matters during our meeting of September 6th because there were not enough voting members present for a quorum; the current bylaws call for representation of at least 50% of the households in order to pass any motion made. will affect the way we do business and we encourage everyone’s input. For your edification, the sections of the CBL that have been proposed to be omitted are crossed out. Following the vote on the amendments, the “approved” crossed out words will be deleted and an updated copy of the CBL will be distributed. The changes/updates to the CBL are in red and underlined. As with the deleted sections, the approved underlined copy will become part of the CBL and the underlining will be removed from the final copy. This is the first major revision to the CBL which was initiated at the 2012 annual meeting. We cannot stress enough the importance of these proposed changes, nor the importance of this document. It spells out how we do business, recognizes how we select officers and gives us the authority to act on behalf of the residents of this community. This will not be a potluck dinner type of meeting; rather, we'll be roasting marshmallows, making S'mores, and drinking hot cocoa and hot cider!! Purpose – election of officers and vote on changes to current bylaws. Bonfire – 6:30 PM until the fire is out. Treats – bring your own marshmallows, graham crackers, and Hershey bars. Hot chocolate and hot cider will be provided by the association. Please have your household represented by at least one adult member!! Thank you for your interest and cooperation and look forward to your participation at the upcoming meeting! Subject: A desperate plea for Woodhaven Officers - We need volunteers!!!!!!!! The time is now to step up!!!!! If you are interested in serving (for the first time, moving up, or remaining in the same office) please let me know ASAP. I know that life is very busy for many people and most volunteer positions take up a lot of time; however, these positions require a minimal obligation of time. In the past, I have served and can validate the time is definitely minimal. We must have these positions filled and no one has stepped up yet, so PLEASE TAKE TIME TO VOLUNTEER AND MAKE A DIFFERENCE IN YOUR NEIGHBORHOOD!!! We will need the volunteer names so we can vote on them during the upcoming annual picnic/business meeting scheduled for September 7th (more information on the business meeting will be coming to you soon). In addition to serving as an officer, we have other ways that you can serve as well. One such individual that I would like to give honorable mention to has made a difference by taking the initiative to develop a Woodhaven Association Web-site. Mrs. Betty Hayes has done an outstanding job creating a site where we can post news and current events. Please take a few minutes and check out the site: http://woodhavenpark.weebly.com. The site has the draft of the minutes from the 2012 association meeting. Thanks Betty for doing such a wonderful job! FYI: We are in the process of updating the association constitution and by-laws and have attached them to this email for your information/review. All members in good standing (those who have paid their dues of $15.00 for the current year) are invited, eligible and encouraged attend and participate in the picnic/annual meeting and vote on the proposed changes to the by-laws. The proposed changes are in red and the proposed deletions are lined-thru. Please save your comments for the meeting at the picnic. We look forward to seeing old friends, meeting our new neighbors, discussing issues that are important to our community and enjoying the variety of food everyone brings and shares at the pot-luck picnic. The flyer on the picnic will be out soon!